More often than not, while doing the things that I do, meeting the people that I meet and facing times and circumstances that I face, I think back on the time of the cliched age of innocence. Happiness at a time meant owning a Pilot microtip pen. Or to own a Sheaffer. Going to the teacher with the monthly test/exam asking for a 're-total' or ask for an extra mark and feel proud to get 47 and 1/2. (on 50) Where 1/2 was written like a 1 and a stylized E in red. A so-called fashion show, where someone would be crowned Miss 6A. With other classmates for judges. Of 'crowns' made of pink cardboard and sequins. Of referring to glitter as 'jigina'. Of being caught by the Physics teacher on "WHY DID YOU HAVE A MISS 6A CONTEST??" Of watching the faces of the top three rank holders in class figure who trounced the other by a fraction of a quarter mark. And then the utter surprise on their faces to find an underdog. Of crushes and I LOVE YOU greeting cards when, I wonder if people even understood what all that meant. Of unfortunately watching a boy who gave a so-called card, getting thrashed by the Mathematics teacher. I happened to think about the Pilot pen and the Geometry box and everything else a couple of days ago and read a lovely post by one of my friends on similar lines. I wonder if as children, we had something called an Ego. If we bothered about who had the last word. Where the biggest disappointment would probably be not having your parent come home in time, or get to see you favorite TV Show, or maybe get fever before a game or something, but be deliriously happy if it had to be about missing an exam. I was a weird kid though. I remember my mother telling me that they (my grandmom and I ) used to be scared to tell me that Saturday and Sunday meant no school. Heard I used to bawl that there was no school. I finished an entire year's work book in a day and got slapped by the teacher for that. And then my mother asking the teacher not to beat me if I finished books like that, (because she was in a dilemma wondering what to do for an entire year) and that she would supply more if needed. Happiness was also going to school on a rained out day. Being one of the very few kids in class. I don't wax eloquently about college because I personally had decided no college in Chennai was going to let me go without harping on the attendance and to me music was more important than marking attendances. Hence it was Madras Univ for me. In retrospect, its funny how the word "partiality" was some sort of a buzz word during school. Getting my LadyBird bicycle. Pink and all. The only thing I remember which was pink in my entire stuff of things that I had. I could not bear the mauve version that they had. Pink was the only other option that I had. The basket and all that. Buying milk from a vending booth. Calm. Quiet. Would we be happier if we remembered to remain the children that we were? Why did so many of us grow up in ways we should not have. Wonder if it is growing up at all. In a lot of cases, we have grown down. Shrunk our horizons. Love less. Accept less. Listen even less. With so much noise, within and without, who is even bothered about listening. Whether it is listening to oneself or listening to someone else? For once I do not have a wish to end this post with. As an afterthought, maybe I do. I wish for you that you can play out the memories that give you a sense of poignancy, a yearning for a time that is gone, even if it is only for a little while, something that leaves your throat a little constricted and your heart a little heavy, in your mind's eye. Something that leaves you with a watery smile. And then of course all our everythingness and nothingness will take over. As it usually does. .................................. ... ... ... .
Nicely written.... did you happen to wing 6A CONTEST..? Was just thinking about my past and saw this post. Very well said, Chinmayi. This is so reassuring, that its not just me, but people as successful and famous as you still take solace from the lost years of innocence. I wish everybody realized how cliched the 'Real World' is, so that our life dont have to be a dog fight everyday. Great blog n many thanks! My 2nd comment in all these years I've been following this blog. Thinking about it, only a child can cry aloud saying he doesn't like the people around him. If an adult does the same, he would be considered "not very social" and would be advised by some people with "come on man, grow up; don't be a kid". Strange isn't it? I guess as a child we didn't have a perception, so we were ready to listen a lot, accept a lot and love a lot. But as we grow our perception filters all those lots. Loved this "something that leaves your throat a little constricted and your heart a little heavy, in your mind's eye. Something that leaves you with a watery smile. And then of course all our everythingness and nothingness will take over. As it usually does." Strange though it may sound- I was just thinking along the same lines. though in a little different way! i often think of Bharathiyar's lines: "nallathor veenai seithu athai nalam keda puzhuthiyil erivathundo, solladi siva sakthi- ennai sudar migu arivudan padaiththuvittai.."
Bharathi was indeed a genius- in using "sudarmiku arivudan.." when he wrote this verse! i sometimes feel i would have been extremely happy born in a village- be an illiterate and not give a damn about what happens in the world beyond my own! There is so much beauty in innocense.. Pity one has to lose it to appreciate it! thanks for allowing a space for us people out here to feedback, very kind of you. Loved ur dresses from Chhote Ustaad. U looked amazing!! Little things make up the great sum of life... must also agree dat lil age is the most blissful time...skool,education nd everything..but remembering ours is fyn...i think things willb much better wen v can help kids of dat age get their education in dis socitey... mayb wen v all realise dis...India may light up... Jai ho!! P.S. dis comment may not b very relevant to d post... bt dis is d first thing that stroke my headafter reading ur post... Cheers!!! Nostalgic! The definition of happiness changes so much in our minds over time. Enjoyed the time travel through your post. Keep writing.Everytime you write something like this, you keep scaling the ladder in my mind, I truly admire/respect you Chinmayi for what you are! //we have grown down//- nice one. You have started to write more philosophically(ref:post on aug 14)...,I swear!!! 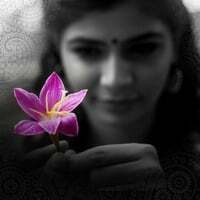 Beautifully written post, Chinmayi. I wonder too where all our childhoods go, when our egos were never so easily bruised, and the tiniest thing became an object of so much fascination. Perhaps, it would be wise to continue to see ourselves as children under the care of a Much Higher Parent, Who watches over us with the same adoration and wonders at how things which are probably just as little from That vantage point have become such objects of obsession for us. Maybe humbling ourselves to This Higher Purpose may put us back in touch with our inner child. It was quite refreshing to read this post of yours. Brought back so many memories. When I was a kid, all I wanted was to become an adult. But now I desperately yearn for the past. The innocence and friendship formed back then are priceless. Wish I had understood its worth a little more back then. Is any of ur songs gonna release in recent future ? somehow this is the only time your posts beats your voice. Brilliant ! PS: to add to many, for me - to have a Rs 10 note in my pocket/wallet felt awesome - i saved it for long and infact to carry a wallet felt awesome. Today i have more, and feels too much ! very strange ! Being 'childlike' - and not childish - is a quality that I need to nurture to stop the world from turning me cynical. 2. I dont think we are pursuing happiness (as preached by many and to some extent our reminiscence about childhood is also because of the perception that we were happy then). We are pursuing meaning in life. What a reminiscing post - "Microtip pen, the half mark symbol,geometry box. Absolutely mind blowing post. I have a doubt that the I LOVE YOU cards you specified was given to u. Is it?????? Amazing post! Thanks for the touching lines. And Happy Birthday! Keep shining! You are a fantastic writer. Emotions and memories related to MY childhood with you came rushing back to me, for some reason, when I read this post. I remember you narrating a few of these incidents to me. Especially the " I love you" card! Miss you! Hope Aunty and you are fine. If I were the author of such a post, you bet I'd have written the Same stuff! Not a single day passes without me thinking of my childhood days that are nothing but CLEAR memories etched in the mind and the heart. I'm kind of 'watery-eyed' after reading this post of yours. Would I be able to post a link of this on my FB page? Do let me know!